We’re going to try to post a summary of our weekly meeting here on the wiki and on the jQuery.org site so everyone can see what we’re up to on the project. Going forward, all communication and meetings will take place on IRC channels for better transparency and to gain input from the jQuery Mobile community. Core dev team discussion is now in #jquerymobile-dev. 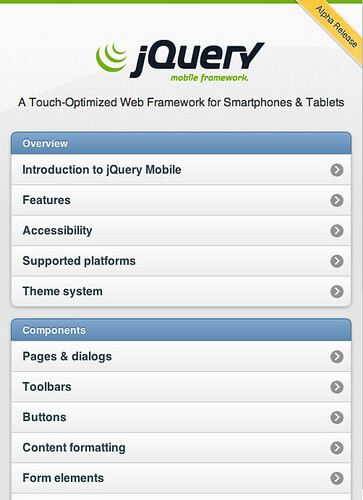 For help with jQuery Mobile, please use the #jquerymobile or #jquery channels on freenode.net. Weekly jQuery Mobile team meetings will happen on the #jquery-meeting IRC channel on freenode.net every Tuesday at 2:00pm EST/11am PST. This issue is tied to recent focus management changes. Solution noted in comments: we just need to bind to the silentscroll event for when we set focus. Kin will try to land this ASAP. Buttons in jQM have 4 states: normal, hover, focus, and down (pressed) which is a bit different from the link’s :hover and :active states. Our active state is not parallel to a link’s :active, instead it’s meant to be more like and “on” or selected state that is only needed for stateful buttons or special cases (like lists) where we want to have an “on” state. Proposed change: only set the active class on a button if we know we’re navigating so any null or # links will get the down state but not active. • Lengthy discussion on how to proceed. • Tangent on initial conditions for tests. • Pulling transitions from changePage(). An easy get? • Navigating to self… legitimate in generated pages? • Moving arguments over to a hash, rename changePage so it can act as a proxy to new one? • Kin will be available to lead the charge on this and everyone else will plug in. First step is to keep filling out the navigation mapping and planning wiki pages here and here. Fix from @brukhabtu for issue 1492 – Errors when trying to delete DOM elements. Check for existence of the bindings object before attempting to use it. Apparently jQuery core strips off any data bindings of an element before calling teardown on it to remove special event handlers. When we switched to virtual mouse events, I just did a straight translation of the code that existed which basically did the collapse/expand on mouseup. In order to factor in scrolling, I needed to move that code into a vclick handler and stopPropagation() and preventDefault() to make sure the button doesn’t activate. – Modified vmouse code so that it uses $.data() instead of $().data() which is significantly faster. – Modified the navigation and buttonMarkup code so they stop using live(). The vmouse code triggers several events during the touch events, which in turn causes the underlying event code to call $.closest() with the selector used during the live() call to figure out if the event should be handled. This turns out to be very expensive, so instead, we now just bind directly to the document, and walk the DOM manually to figure out if we should handle it. This is much faster since we are avoid triggering multiple nested function calls. – Modified _itemApply() to make use of item.children() and filters. Also got rid of some unused code. – Convert .each() in refresh() to a loop. – Cache some $list.jqmData() values so we don’t do it for each list item. Thanks to everyone who helped us get Alpha 4 released last week. Overall the response has been great but there were a few important issues that cropped us once the new version was out in the wild that we wanted to address sooner as an official release. So today, we’re release Alpha 4.1 as a maintenance release. After Alpha 4 was released, we continued to hear issues about Ajax requests with file:// extensions failing in PhoneGap. We discovered that the fix we landed to set the dataType: “html” parameter for all jQuery Mobile Ajax requests disappeared between commits and didn’t end up included in Alpha 4. We went ahead and re-applied this fix and have confirmation that links are now working like a charm under PhoneGap. Overall, the new virtual click system seems to be working great across our target browsers and provides a centralized way to smooth out all the event differences across platforms. However, the way we were handling clicks in the new virtual click system was causing issues in certain cases: click handlers in custom code weren’t being called consistently, and if you tapped quickly on an element, touch and click target mismatches made it look like there were two click events on elements like Back buttons, list views, and other widgets. We fixed this in 4.1 by changing the virtual click handler to fire on the click event (instead of the vclick event) and setting prevent default. This change introduced a noticeable lag in the visual feedback for the active state on lists and buttons so we made some tweaks to make the “perceived” visual performance feel as fast as A4 by applying the active state on vclick. We’ll continue to refine the events as we head towards beta, but this fix addressed most of issues we’ve been hearing about. Scroll position wasn’t being remembered when navigating back to a page in iOS. This was a regression from A3 and is an important part of how web pages and apps should work. We fixed this by setting the focus order on page show to 1) previously clicked item if revisiting that page 2) page title 3) first focusable item in the page. We have plans to further refine the way this works as we re-factor our page transition code to make it smoother for beta. An error was causing jQuery Mobile to fail in IE8 & 9, but we’ve resolved the error by adding an activeElement conditional and pages now render suprisingly well. There are a few style tweaks needed to make this perfect, especially on form elements, but jQuery Mobile now works in IE 7, 8 and 9. The team is moving quickly with bug fixes and optimizations so in the last week, these issues also have been resolved and are included in 4.1. Navigation in a multi-page configuration – If you had a multi-page setup and if on the first page, you clicked on an anchor that linked to itself you’d see a blank page (an edge case, but possible).We fixed this by looking to see if the data-url matches the links href, and if so, it adds preventDefault and does nothing. pagebeforehide and pagebeforeshow were returning undefined when referencing ui.prevPage and ui.nextPage. Fixed by passing a null event param for page _trigger beforehide and beforeshow (thanks Phil Barnes). Ajax loading overlay was appearing beneath slider handles – We fixed this by setting loader z-index to be higher than the slider handles. Checkboxes were only firing a change event when checked, but not when un-checked. We fixed the scoping issue that was causing the checkbox check to fail. We get asked all the time about exactly when jQuery Mobile 1.0 will be released and we understand that a lot of people are waiting for us to hit that milestone to use the library. As a project, we are committed to getting to 1.0 as quickly as we can while providing an exceptional user experience that works on the greatest number of devices and platforms. This is quite a challenge, but we feel it’s incredibly important delivering on the promise of the open web and universal access. Getting there will take time so we appreciate your patience. As of A4, we are feature-complete for 1.0 and are focusing on perfomance, compatibility, bug fixes, API improvements, and documentation. In terms of timing, we were hoping to have the beta release ready for the jQuery Conference in SanFrancisco next weekend, but the complexity of landing the global namespacing and virtual click event systems for A4 combined with this maintenance release have pushed our timelines out a bit. At this point, we still have a fair amount of major platforms to debug (Nokia, BB5, etc.) and a solid list of issues to fix so beta is still a few weeks out at a minimum. The exact timing for beta and 1.0 are going to be determined by the quality of the code and device support, not a rigid timeframe, because we want to ensure that 1.0 is rock-solid. Going forward, we’re going to be blogging more frequently with interim updates on what we’re working on so you can follow our activities as we move towards 1.0. The team is very active so we’re excited to share our progress so the community can give us more immediate feedback and take advantage of fixes as they land. As always, we maintain an active jQuery Mobile Twitter account and “jquerymobile” Channel on freenode IRC for day-to-day updates, tips and Q&A. 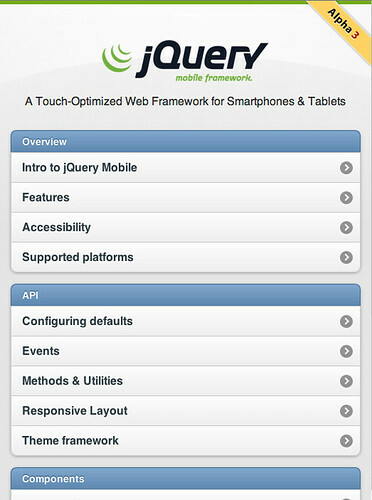 We’re pleased to announce the third alpha release of the jQuery Mobile project. This release includes a number of bug fixes and enhancements to the original jQuery Mobile Alpha 1 and jQuery Mobile Alpha 2 releases. The team made about 480 commits! Fixed our “fixed” toolbars – Thanks Kin! Right now we’re planning on releasing the first beta within the month before moving on to our 1.0 release. Our goals moving forward are to improve performance, user-experience and responsiveness, and extend our support to Windows Phone 7, BlackBerry 5, and Nokia devices, among other browsers. Please follow our twitter account for updates: @jquerymobile. More details on how this works can be found in the page and layout documentation. The Ajax naigation system has been deeply re-factored to improve performance and handle more edge cases. This includes event handling for click, submit, and hashchange, all of the base tag management, path management, active link class handling, etc. and better support for dialogs. We changed page navigation scripting to use data-url attributes instead of IDs for storing page URLs. This fixes a number of issues, most importantly a bug which exposed a conflict between jQuery’s selector engine that would result in un-enhanced pages whenever linking between two pages in the same directory. The shift away from interal ID attribute usage also allows users to bind page events (pagecreate, pagebeforecreate) to a page div by its ID, which was a frequent cause of confusion when it didn’t work as expected in former versions of the framework. Fixed baseTagTest() in jquery.mobile.support.js, so that it uses any pre-existing base tag for testing. This fixes the bug on Webkit (Safari) where the relative paths for links were being resolved/expressed with the document path instead of the original base path. Page transitions are now smoother and we have more improvements queued up for the next release. Fixed positioning of headers and footers was completely re-factored and is much smoother so they no longer scroll with the page. Persistent footer nav bars now reliably show across pages. Fixed rendering issues with single item lists, first/last item styles and thumbnail images. Made the list parser more forgiving of whitespace, line breaks and other formatting. Nested lists can now be deep-linked to via the hash and support the auto-generated back buttons. Split buttons now work in older versions of Android and work correctly after calling refresh() for dynamically added items. Now support enable, disable, and refresh methods (where applicable). Native form elements can be used by adding data-role=”none” attribute on the element or globally via the global keepNative option. Form controls can now be styled with data-theme attributes and will automatically inherit the theme swatch of their parent container. Ajax form handling has been improved. New touch events make these much more responsive, and can now be operated with the navigator keypad on Android and Blackberry 6, as well as through standard keyboard input. 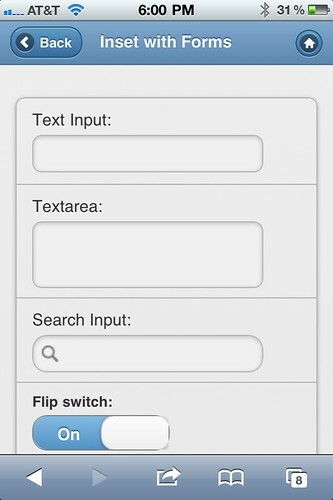 New touch events make these much more responsive, fixed a bug that validated the text input too fast to enter a value. We now bind the slider drag event handling to touch and mouse events, which allows us to support Opera Mobile, Blackberry and other platforms. Deep re-work of select menus to improve performance and feature set. New features include support for multiple select, optgroups, placeholder and disabled options. Native select menus can now be used instead of custom menus by adding data-native-menu=”true” attribute for even faster performance with long lists while maintaining the custom select button style. 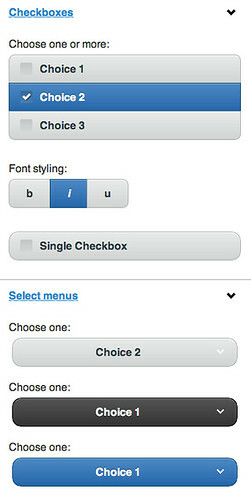 Now, form input/button elements are appended to a div-based “button”, invisibly filling its width and height. The user now interacts directly with the native control, rather than having to trigger a click from another anchor (which formerly prevented some native submit event handling from working). A workaround is still included to ensure the input’s name/value is submitted along with the form when it’s not a type=reset, as this is necessary for the button data to appear in the serialized form data. Added new icons for home and search. Added extra padding to buttons that don’t have text labels (icon only) to improve hit area. Improved the contrast of the focus state for lists and buttons to make them more usable in Android with the navigation pad. Tweaked gradient styles to better support Firefox and Internet Explorer. Fixed icons and loading image issues on Opera Mobile. For this release we would like to thank Filament Group (Scott Jehl, Todd Parker), Adobe (Kin Blas, Jorge Taylor), John Bender, Brightcove (Jesse Streb, Ashley Streb), Eric Hynds, Ben Alman, Jörn Zaefferer, Alex Kovar, Adam Messinger, @davibe, Louy Alakkad, @medovob and many others. 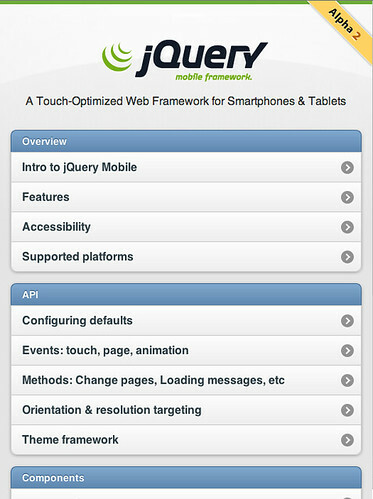 We’re pleased to announce the second alpha release of the jQuery Mobile project. 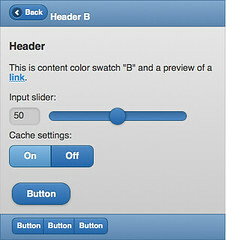 This release includes a number of bug fixes and enhancements to the original jQuery Mobile Alpha 1 release. Overall the quality of jQuery Mobile has been greatly improved. A number of subsystems have been rewritten (both for clarity and for performance) and cross-browser compatibility has seen a marked increase in quality. We’re planning on releasing at least one more alpha (or beta) before the end of the year, followed by a final 1.0 release in January. 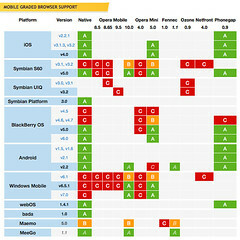 NOTE: jQuery Mobile 1.0 Alpha 2 requires jQuery 1.4.4. The current state of the jQuery Mobile test lab. The performance of loading a large listview has been greatly improved. We’re seeing around a 3x improvement in speed, depending upon the platform. Additionally you can now call refresh on a list view for when you add new items, to apply the list view styling to them. The new refresh functionality has been added to select menus as well, allowing you to add the select menu styling to newly-injected items. Additionally the accessibility of select menus has been improved, allowing your to navigate through the select menu using the keyboard (such as being able to open the select menu with the ‘enter’ key and navigate using the arrow keys). The performance of page scrolling has been greatly improved – as has the performance and quality of fixed headers and footers. The navbar functionality has been overhauled using the grid model work provided by the framework allowing for much greater flexibility in the design of the navbar. Much of the handling for loading new pages (via Ajax) has been overhauled and tremendously improved. The functionality has been encapsulated in a new changePage method that gives a great amount of flexibility as to how data should be loaded and how page-to-page transitions should work. In addition to the automatic handling of internal links (converting them into Ajax requests and introducing smooth page-to-page transitions), Alpha 2 also handles the same functionality for forms. Form submissions will now pass through the changePage method – allowing for smooth form submission, transitions, and page loads. More information about this technique can be seen in the documentation. All of the relevant jQuery Mobile widgets have moved over to building off of the jQuery UI Widget Factory. This gives us the ability to have greater extensibility and methods (such as the ability to disable controls). Specifically in this release Dialog, Form Buttons, listview, collapsible, Checkbox/Radio, textinput, slider / switch, Select menu, have all moved over to the widget factory, and we’re continuing to work on extending the methods and events those plugins provide. In addition to moving to the jQuery UI Widget Factory a new method for dialogs has been introduced: close (naturally, allowing you to close a dialog once open). You can call it like so: .dialog("close"). jQuery Mobile now has a number of ways to override the initial configuration of a number of aspects of the framework (such as disabled Ajax-style links or forms). This can allow you to sculpt jQuery Mobile to work in situations that are more-specialized and don’t fit the complete design methodology of the framework (giving you the ability to only use a couple widgets rather than the framework as whole, for example). A new set of CSS classes have been introduced that are automatically updated on resize and orientationchange that you can use to scale your layout to particular devices and rotations. These are designed to work even in browsers that don’t support CSS Media Queries. A number of static methods have been added to make some common tasks quite simple, such as: Scrolling the page, showing the loading message, changing pages, and other tasks. The documentation for jQuery Mobile’s events has been drastically improved. jQuery Mobile publishes a number of events that can be utilized to write complex mobile applications (and can be used separately from the jQuery Mobile framework). For this release we would like to thank Filament Group (specifically Scott Jehl who was responsible for much of the development of the release and Todd Parker who was responsible for the design), Adobe (specifically Kin Blas who helped to fix a number of bugs and Jorge Taylor), Ben Alman (for helping to improve orientationchange), RIM (for providing us with test devices), and Nokia (for providing us with test devices). Today we’re pleased to announce the first alpha release of the jQuery Mobile project. jQuery Mobile is a user interface framework, built on top of jQuery, designed to simplify the process of building applications that target mobile devices. We’ve made really good progress since we first announced the project two months ago. We’ve created a number of components, layouts, and theming tools to greatly simplify the process of building a mobile application. For this first alpha release we’ve managed to cover support for many of the A-Grade browsers that we wish to support (such as iOS devices, Android devices, Blackberry OS 6, webOS, Fennec, and Opera Mobile). There are still bugs on those platforms and a few of the other platforms are failing pretty hard. We’re working to resolve these issues in time for the 1.0 release. Graceful Degradation: jQuery Mobile uses the very best HTML 5 and CSS 3 features to provide the best possible experience in the most-capable browsers. However we don’t consider this to be an all-or-nothing proposition: Less capable browsers will still receive the best possible experience that their platform can handle. They may not have all the gradients or fancy transitions of the best platforms but they’ll still be highly usable. The most basic browsers will easily degrade back to simplified HTML and CSS. Accessibility: All jQuery Mobile components are ARIA accessible. They are keyboard navigable (on a desktop computer) and can be navigated using a screen reader. While at this very moment jQuery Mobile is highly targeted at mobile devices we hope to quickly grow the scope of the project to encompass many platforms: mobile, tablets, desktops, and beyond. Theming: jQuery Mobile has a comprehensive theming structure built from the ground up to enable you to build capable web applications. This goes far beyond the styling system provided by jQuery UI and gives you the ability to truly adapt the styling of your entire application. For the alpha release all theme configuration must be done manually but for the final 1.0 release we’ll be providing a complete Themeroller tool for theming your application. Reminder: This is the first alpha release of the framework. There will surely be bugs in your platform of choice. The best way you can help us is to use it, file bugs, and even provide patches back. Please discuss issues that you encounter in the Developing jQuery Mobile forum. We’re looking to do a few more preview releases during the next couple months leading up to the 1.0 release of the platform in January. Thanks for your help! Filament Group – For providing countless development hours to the project – taking it from a mere idea to a full-fledged framework in an incredibly short amount of time – they are super-human. Adobe – For providing us with developers to help fix bugs and do testing. 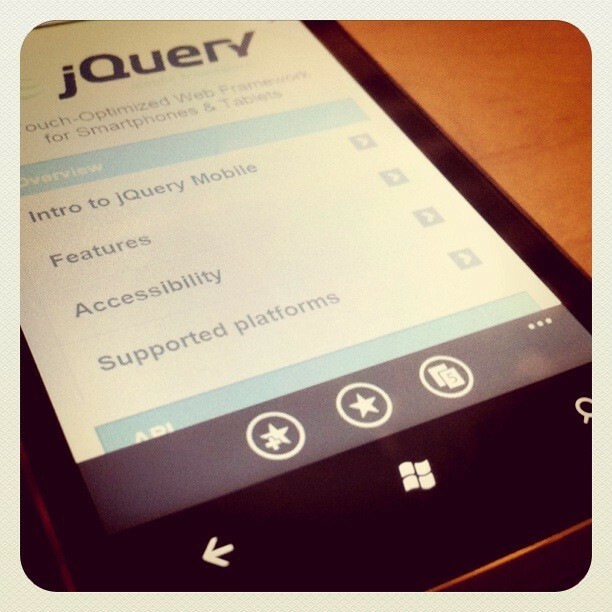 They’re doing some great things with jQuery Mobile and we’re really excited to see how they can push it forward. DeviceAtlas – For providing us with advice and financial support. The DeviceAtlas folk have been doing mobile work for a long time now and have an incredible amount of insight into the platforms. They build tools to make it easier to practically deploy mobile web applications. Mozilla Corporation – For providing us with devices to test against and for sponsoring the development of John Resig to work on jQuery and jQuery Mobile. 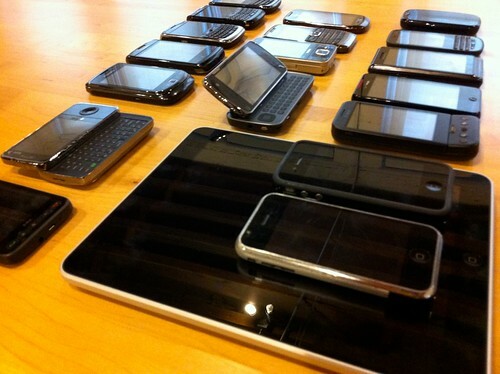 Nokia – For providing us with devices for testing. Nokia is working on a great platform for deploying web technology-based applications to Nokia devices. We have a number of components and features that we weren’t able to finish for the alpha release. We will be tackling them soon and they should be ready by the time 1.0 is ready. 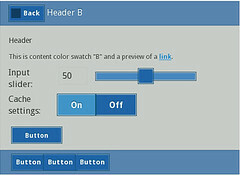 Themeroller Support – jQuery Mobile is completely themable but we hope to make it even easier with the Themeroller tool. Tablet Optimization – Basic tablet support exists now but we’re looking to make some rather large improvements. This is the first status update regarding the work that we’ve been putting in to jQuery Mobile. We hope to have similar updates about once a week – along with posts describing new things that we’ve learned along the way. Some sample components implemented by the folks at Filament Group. Currently the components are done purely in HTML/CSS (no images), are ARIA accessible, and are completely implemented using progressive enhancement. 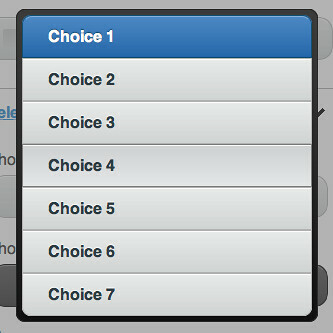 This is a sample modal dialog from which options from a large select menu could be displayed. 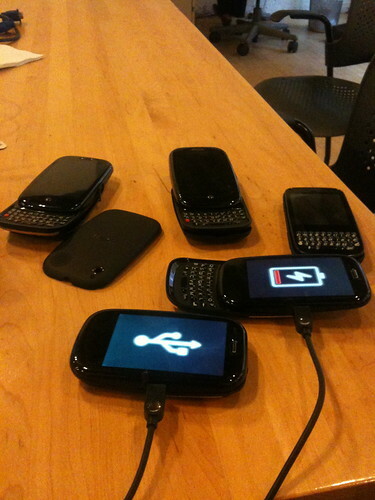 The webOS team recently sent us a few more phones to test against so we’re actively adding them in to our test bed and hooking them into TestSwarm. A few commits have landed the past couple days (and quite a few more will be landing over the next couple) taking care of compatibility issues in Blackberry 4.6 and 4.7. Make sure .val() on empty options returns the text value rather than the value. Make sure that missing attributes return undefined. 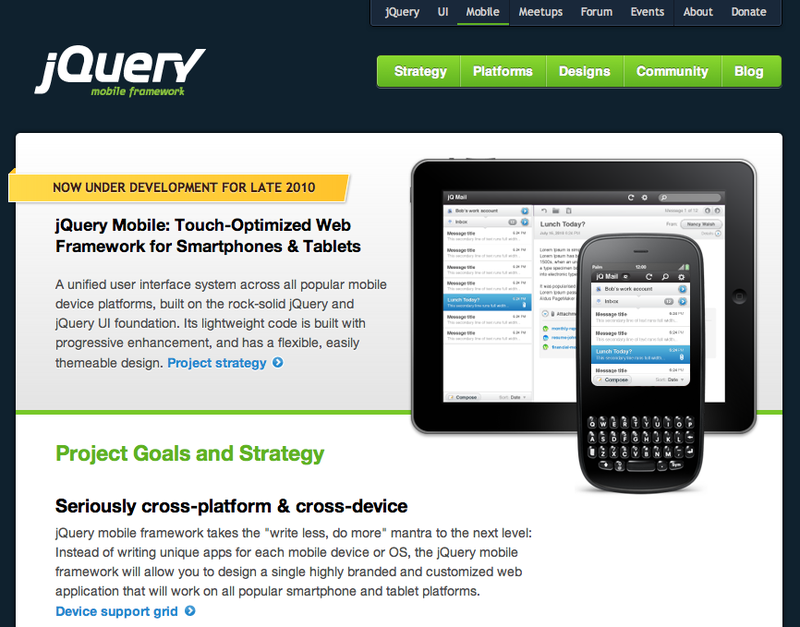 The jQuery project is really excited to announce the work that we’ve been doing to bring jQuery to mobile devices. Not only is the core jQuery library being improved to work across all of the major mobile platforms, but we’re also working to release a complete, unified, mobile UI framework. Right now we’re working hard, planning out the features that we want to land and doing testing against the devices that we want to support — and hoping for a release later this year. If you wish to help, please join the discussion in the jQuery Mobile Community. 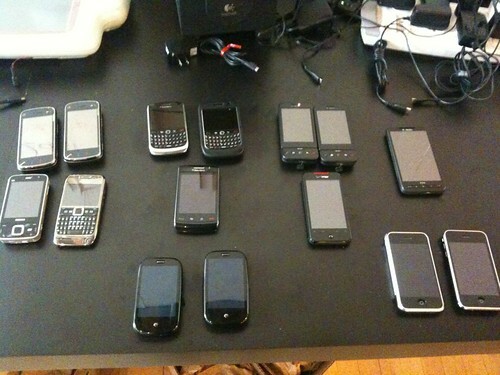 The start of jQuery’s Mobile testing lab. 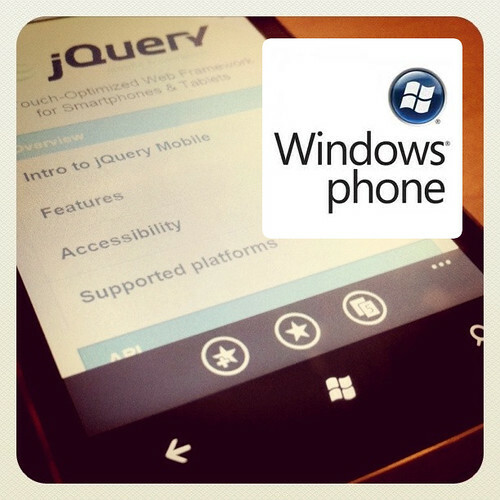 The jQuery project has received sponsorship from a number of mobile browser vendors as well. We’re thrilled to be working on this project. The mobile web is desperately in need of a framework that is capable of working across all browsers, allowing developers to build truly mobile web sites. We’re doing all we can to ensure that jQuery Mobile fills that need.